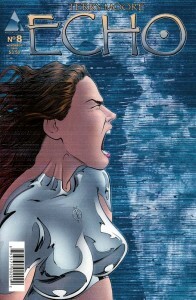 My next comic book club selection is Terry Moore’s Echo , issues #1-13. The first 10 are collected in two trade paperbacks already. Echo is his latest creation, but I have been a fan of Terry Moore’s earlier series, Strangers in Paradise, since college. I am looking forward to hearing everyone else’s opinion about how this new story plays out from the beginning. We’ll meet on Sunday, September 20th* at 3PM at Florence & Marty’s apartment. *We are postponing from the 13th to the 20th to protect visitors from our flu. This entry was posted by florence	on Sunday, August 23rd, 2009 at 8:35 am and is filed under artist/creator(s), book club, independent. You can follow any responses to this entry through the RSS 2.0 feed. You can leave a response, or trackback from your own site. I will be working till 3pm on the 20th, but given that we usually start late that should not be an problem.